Blueberries and Lemons go together in baking like apples and cinnamon… truly! Whether it’s muffins, cakes or breads, the combination of those two flavors are a dynamite pairing, and today I’m bringing you a fantastic bread that has a glaze on the top that really kicks this recipe up a notch and makes it a stand-out one you’ll love. Try it, you won’t be sorry! Preheat oven to 325 degrees. Grease and flour a 8½ x 4½ x 2½ loaf pan and set aside. In a bowl, whisk together the flour, baking powder, and salt. In another bowl, cream together the butter with 1 cup of the sugar with a electric mixer until light and fluffy. Add eggs, one at a time, to the butter mixture. Beating well after each addition of egg. Beat in the lemon peel. Next, add ⅓ of the flour mixture to the butter mixture. Then alternately add half the milk with half of the remaining flour mixture, being sure to end with the flour. 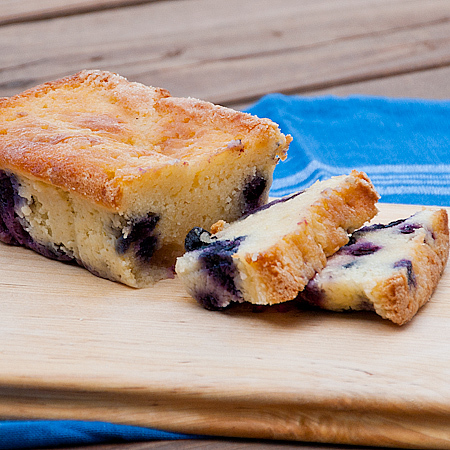 Toss the blueberries in about ½ tsp flour to coat. This will prevent them from sinking in your bread. Fold the blueberries into the batter. Pour the batter into the prepared loaf pan. Bake for 60 minutes until golden and a toothpick inserted in the center comes out clean. While the bread cooks, add the remaining ⅓ cup sugar to a saucepan along with the 3 tbsp lemon juice. Bring to a boil and then remove from the heat. Once the bread is cooked, pierce the top of the bread with a toothpick several times. Be sure to not go all the way through the loaf. Pour the hot lemon/sugar mixture over the bread. Allow to cool in the pan for 30 minutes, then remove from the pan and allow to cool completely.